On April 9, Vanessa O’Brien will set off for one of the most inhospitable landscapes on the planet, the North Pole. Frigid, shifting ice floes will make for brutal conditions. Temperatures may plunge to minus 30 to minus 45 degrees, cold enough to freeze exposed skin in under a minute. O’Brien, 48, of Boston, won’t have much time to get there. She needs to make it to the pole this month in order to set a new world record for climbing the highest peaks on all seven continents, and reaching the South and North poles, faster than any woman ever has. She intends to complete that feat, known as the Explorers’ Grand Slam, in about 11 months. “The obvious question is why,” O’Brien said in a recent phone call from a camp on Mount Kilimanjaro, a little more than halfway up the 19,341-foot peak, the highest in Africa. O’Brien, a former banker, lives on Marlborough Street near the Public Garden, but in recent months she’s usually found in more remote locations. Besides Kilimanjaro, she has since May 2012 scaled Everest (Nepal), Elbrus (Russia), Aconcagua (Argentina), Carstensz (Indonesia), Mount McKinley (United States), and Vinson Massif (Antarctica), joining a list of about 53 other women who have done so. (O’Brien also climbed Kosciuszko, at 7,310 feet the tallest mountain in Australia, which is sometimes included on Seven Summits lists with or in lieu of Carstensz.) In December, she trudged to the South Pole after being dropped off by ski plane 60 nautical miles away. “But if it wasn’t already clear to me, and it was, that failure drove home the fact that it is a deadly serious sport. 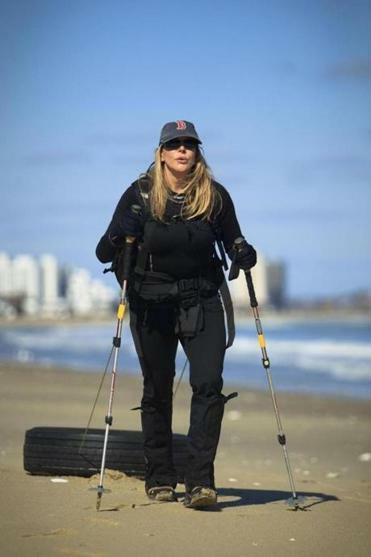 It isn’t a game in any way,” said Vanessa O’Brien, who trains by dragging a tractor tire on Revere Beach to build endurance and lung capacity. The North Pole trek will pose very different challenges. O’Brien and her team — expedition leader Doug Stoup of Ice Axe Expeditions, and Santa Monica-based Karl Pettijohn, one of her climbing partners from Everest — will rendezvous at the Longyearbyen settlement in Svalbard, Norway. By ski plane, they will head to 89 degrees North, where they will begin the frigid and wet journey. As a teenager growing up near Detroit, O’Brien knew she wanted to climb. But instead of mountains, she hoped to climb the corporate ladder — inspired, friends say, by her very determined mother, a nurse who overcame challenges both professional and physical, including the loss of an arm. After graduating from New York University Stern School of Business, O’Brien worked her way up in the financial services industry as an executive at Bank of America, Barclays, and Morgan Stanley, in the United States and in the United Kingdom. Almost immediately, O’Brien said, she became keenly aware of the potential for some resentment among those in the elite climbing world. O’Brien wasn’t an experienced climber, but she had the means — that is, the money — to get very serious about the pursuit. Indeed, climbing and trekking can be very expensive. O’Brien’s South Pole trek cost about $45,000. The North Pole will cost about the same. Her climb up Everest cost about $70,000, including travel, equipment, guides’ salaries and Sherpa fees. O’Brien made her first successful major climb in 2005 — just months after she decided to start climbing — ascending Kilimanjaro. But she said the best climbing “lesson” she’s ever learned came almost three years later, the first time she attempted Everest. When she reached the summit of Everest — the world’s highest peak at 29,035 feet — last May, it was with both elation and sadness, as Duane Nelson, a Portland, Ore.-based executive with Intel Corp. and member of her party, lost all the toes on his right foot to frostbite, and several other members of her party developed altitude sickness and had to turn back early in the climb. Nelson, a marathon runner and experienced climber, said O’Brien made it to the top because she was simply better prepared. Seattle-based Mike Hamill, a star climbing guide, photographer, and author, who has scaled all seven summits at least four times and some as many as 20, reiterated Nelson’s praise for O’Brien’s preparation. Mixed martial arts fighter Brett “The Hammer” Oteri, O’Brien’s trainer at Equinox gym in Boston’s Financial District, gives a satisfied chuckle whenever he hears of people in awe of his client’s fitness level. Their workout routines take about 30 hours per week, including Pilates, yoga, and weight lifting in the gym. Several more hours are spent on Revere Beach with O’Brien dragging a 50-pound tractor tire through the sand to build endurance and lung capacity. Jonathan O’Brien, her British-born husband, said you couldn’t pay him to climb a mountain, unless it was a short distance to a ski lift. But he’s not surprised by his wife’s determination. The couple met when the bank he worked for purchased the bank she worked for in London, and his team was brought in to manage the merger. They moved to Boston in 2011. The couple has no children. Returning to Boston recently from her Kilimanjaro climb, O’Brien — tired and windburned — could not stop smiling.